Festuca (fescue) is a genus of flowering plants belonging to the grass family, Poaceae (subfamily Pooideae). They are evergreen or herbaceous perennial tufted grasses with a height range of 10–200 cm (4–79 in) and a cosmopolitan distribution, occurring on every continent except Antarctica. The genus is closely related to ryegrass (Lolium), and recent evidence from phylogenetic studies using DNA sequencing of plant mitochondrial DNA shows that the genus lacks monophyly. As a result, plant taxonomists have moved several species, including the forage grasses tall fescue and meadow fescue, from the genus Festuca into the genus Lolium. Because the taxonomy is complex it is not clear how many true species belong to the genus, but estimates range from over 400 to over 500. Fescue pollen is a significant contributor to hay fever. Some fescues are used as ornamental and turf grasses and as pasture and hay for livestock, being a highly nutritious stock feed. Fescues are common on golf courses in the US and UK, usually beyond the second cut in the rough. Fescue is easily established on bare ground, outcompeting other plants and persisting over several years, and so is often used in soil erosion control programs. Tall fescue (F. arundinacea) is good for this purpose, and one cultivar, 'Kentucky 31', was used in land reclamation during the Dust Bowl of the 1930s in the US. Fescue is sometimes used as feed for horses. However, fescue poisoning, caused by ergot alkaloids produced by the endophytic fungus Neotyphodium coenophialum, is a risk for pregnant mares. During the last three months of pregnancy fescue poisoning increases the risk of spontaneous abortion, stillbirths, retained placenta, absent milk production, and prolonged pregnancy. Incorporating legumes into the fescue can be a way to increase livestock gains and conception rates, even if the fescue is infected. 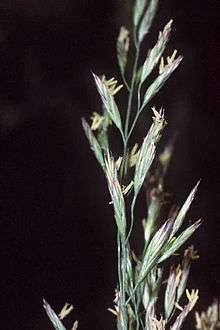 Wikimedia Commons has media related to Festuca. Wikisource has the text of the 1920 Encyclopedia Americana article Fescue. 1 2 3 4 Darbyshire, S. J. and L. E. Pavlick. Festuca. Grass Manual. Flora of North America. ↑ Darbyshire, S J (1993). "Realignment of Festuca subgenus Schedonorus with the genus Lolium (Poaceae)". Novon. 3: 239–243. doi:10.2307/3391460. ↑ Stančík, D. and P. M. Peterson. (2007). A revision of Festuca (Poaceae: Loliinae) in South American páramos. Contributions from the United States National Herbarium 56 1-184. ↑ Inda, L. A., et al. (2008). Dated historical biogeography of the temperate Loliinae (Poaceae, Pooideae) grasses in the northern and southern hemispheres. Molecular Phylogenetics and Evolution 46(3) 932-57. ↑ Esch, R. E., et al. (2001). Common allergenic pollens, fungi, animals, and arthropods. Clinical Reviews in Allergy and Immunology 21(2) 261-92. ↑ Schardl CL, Leuchtmann L (2005). J Dighton, J F White Jr., P Oudemans, eds. The Epichloë Endophytes of Grasses and the Symbiotic Continuum. The Fungal Community: Its Organization and Role in the Ecosystem (Third ed.). CRC Press. pp. 475–503. ISBN 0-8247-2355-4. ↑ "Fescue Toxicosis in Horses". Department of Animal Science. Cornell University. ↑ Fescue Toxicosis. Ohio State University Extension. ↑ GRIN Species Records of Festuca. Germplasm Resources Information Network (GRIN). 1 2 Catalán, P., et al. (2009). Festuca aloha and F. molokaiensis (Poaceae): Loliinae), two new species from Hawai'i. J Bot Res Inst Texas 3(1) 51-58. ↑ "Festuca edlundiae S. Aiken, Consaul and Lefkovitch". Flora of the Canadian Arctic Archipelago. Canadian Museum of Nature. ↑ "Festuca riccerii". Galleria della Flora italiana (in Italian). ActaPlantarum. Retrieved 30 April 2013. ↑ Müller, J. and P. Catalán. (2010). A new rhizomatous species of Festuca (Poaceae, Poeae) from northwestern Argentina. Darwiniana 48(1) 87-92.